This is a follow up to Debbie’s previous post relating to the Google Video link I sent her! It is now 12 weeks since I was blessed (?) 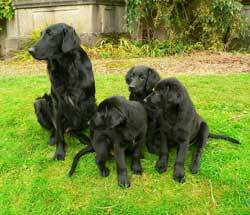 with the arrival of seven gorgeous Flatcoat Retriever puppies, their mum Fern has been an absolutely brilliant mother …. 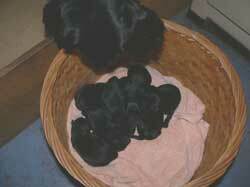 and it has been her first litter. In anticipation of their arrival, I activated a full litre of EM-1, so I had 20 litres of EM to ensure that the ‘maternity wing’ would be a healthy one and to ensure the pups would get a head start! So here we have a picture of a very proud mother checking out her gorgeous babies. At this stage, mum was doing all the work, cleaning up all that the babies ‘produced’, but she was helped by the fact that the whelping box was sprayed on a very regular basis with EM. 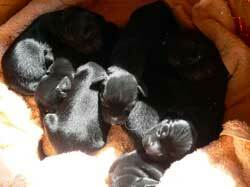 Two day old Flatcoat puppies! Who would think that these small, blind, deaf, defenseless creatures would turn into a pack of needle toothed, chewing monsters – whose agenda was either to rip up or chew anything in their path (when not fighting with each other) …… while at the same time making as much mess as possible! Those of you who have experienced the arrival of a litter of puppies will know that the most essential item is a large supply of old newspapers, however, there is can be associated smell problem. Mum will clean up after them initially, but there are limits! There is a cut off point – then you have your work cut out. 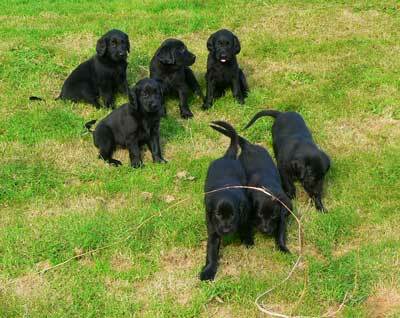 It is then that the smell of puppy wee & poo can become a problem – and the disinfectants come out! For those of you who don’t know about EM (Effective Microorganisms), the one thing that they do love is ‘muck’ and puppy muck to them is ‘manner from heaven’! Not only with they help clean it up, but will also neautralise any smells and when used at a low dilution rate, activated EM will act as a disinfectant. The combination of liberal applications of activated EM and eMc Probiotic Citrus Cleaner meant that the kitchen …… yes, my kitchen, ….. smelt clean and fresh ….. environmental health would disapprove no doubt ….. and as in this house this in no ‘her indoors’ as Arthur Daley (remember him?) would say, there were no complaints!! Most folk would probably apply liberal applications of disinfectant and anti-bacterial sprays …. but not in this house …. it is an EM house and as such is cleaned using EM to ensure it is populated with the beneficial microbes. The pups thrived in their EM environment and as soon as they started to feed on solids, they had some EM bokashi bran added to their feed – they also had EM in their drinking water – just like their mum, who, regardless of all the stresses and strains of motherhood, retained a wonderful shiny coat. The pups have grown really well and are amazingly fit and healthy, regardless of the fact that they have a penchant for all things horrible, which include the chicken’s droppings and their latest favourite – sheep poo! Marvelous! Four of the monsters have now gone to new homes, one of which, Monty has taken up tax exile in Jersey! Now, I intended only to keep one of the pups – and that was a wicked little girl called Moss, however things never go to plan and one her brothers – Rob, stood out from the others and so I decided to keep him too. Then there was Oscar …. he was the smallest in the litter, but a real character, who although everybody fell in love with, he wasn’t picked, so being a big softy, he staying too! So, I now have 3 very energetic pups that tend to run riot in the house and as result get very wound up – the result of which is that ‘accidents’ to tend to occur. Fortunately, I always have a spray bottle of EM to hand and it has been a god send. My mother’s remedy for ‘puppy accidents’ was a good squirt of soda water to ensure no stains on the carpet – now we know we she should always make note of what our mothers teach us, but on this one I disagree …. because EM is BRILLIANT …. a good squirt of EM and there are No stains and NO smells. A Happy Hound is an EM Hound!